Jack Westwood walks past the cracked ceilings and dirty walls of the Wilson stop of the Red Line almost every day. Westwood, 29, an Uptown resident, is one of about 7,200 people who use the out-of-date station daily. The last renovations to the Wilson stop were minor updates in the 1950s. He looks forward to what a new facility could mean for his community. He won't have to wait much longer. The $203 million Wilson Station Reconstruction Program will be one of the Chicago Transit Authority’s largest El station projects in history. Construction is slated to begin in fall of 2014 and will replace the badly deteriorated facility built almost a hundred years ago, in 1923. The station will remain open during the renovations, which are expected to take about 34 months. Work will be done during the overnight and weekend hours to make every effort to minimize impacts to customers, CTA officials say. The new station plans feature contemporary architecture with steel framed, translucent canopies and a glass enclosed entrance that will serve as the main entrance which will now be at the south side of Wilson avenue with two auxiliary entrances, creating greater access for customers. The CTA hopes to capture more customers with these renovations. More features to improve the customer experience include new escalators, additional turnstiles, and new lighting. A significant amount of work will also be done on the infrastructure; the replacement of track and viaducts, a new elevated support structure, and upgrades to the signaling system to improve reliability of service and travel times, said Catherine Hosinksi, a CTA spokeswoman. “This includes wider platforms, the addition of up to a hundred security cameras, throughout the station which will focus on the station and the surrounding area, and also the reduction of the support columns in the street and sidewalks,” Hosinki said, adding safety was a focus for the renovations. Martin Tangora is a long-time Uptown resident who closely follows architectural preservation issues in the neighborhood. Tangora said the CTA has not explained why alternate plans can’t be made to save the historic resource. “The only explanation they give for that is ‘The bridge has to start there.’ They haven’t explained why it has to start there. They haven’t explained it in terms of engineering difficulty, cost, or even in terms of aesthetics. Just, ‘that’s the way it has to be’,” said Tangora. Tangora said he believes the station renovations are necessary but is still disappointed that the building was not preserved. Joe Schwieterman, director of the Chaddick Institute for Metropolitan Development at DePaul University, hopes a modern update for the historic station could bring opportunities to the struggling neighborhood. “Wilson is really one of the great glory year stations. You look at the great theaters and the Uptown theater is right there,” he said. During the 1920s, the theater district in Uptown brought many riders to the Wilson stop. It’s decorative design welcomed riders with a grand staircase, barbershop, and restrooms in the station. Developers built large apartment buildings to accommodate the growing population and with little room for parking, the dense neighborhood became a neighborhood of transit riders. “The CTA now needs a little bit of an image lift, so if it can take some of the historic stations and make that part of its image and celebrate that history, that adds a little charm to the daily experience,” Schwieterman said. 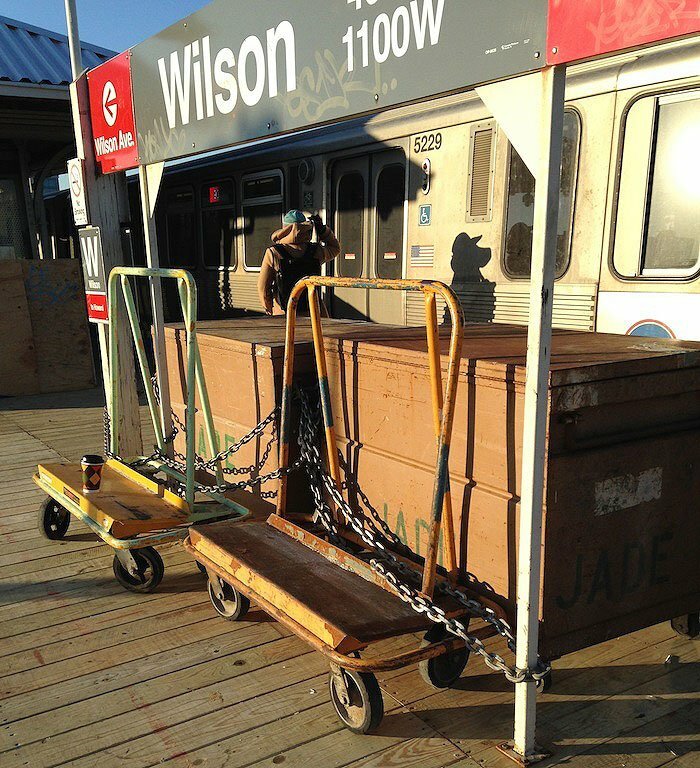 The Wilson stop will also become the only transfer station, between the Howard and Belmont stations, when it becomes a Purple line transfer point for Purple and Red Line Express trains. The service was discontinued a few years ago. “A lot of people within the area and neighborhood have been waiting for this, their day has come,” said Hosinski. She said the CTA has received positive feedback for the project finally coming to fruition after 10 years of planning. Ald. James Cappleman (46th) said the El renovations are a “godsend” to the area, which is trying to increase retail in the area. The area around the station is changing rapidly partially due to projects funded by Tax Increment Financing. The Wilson Yard TIF recently funded affordable housing developments and a new Target store nearby. However, some members of the Uptown community are concerned about how these changes might affect low-income residents. Schwieterman also said that gentrification will be an issue, but that change is inevitable.